An article to be pulished in “The Astrophysical Journal” describes a research on the age of the TRAPPIST-1 system. This ultra-cool dwarf star has become increasingly popular thanks to the results of research on its planets. One of the problems was to establish its age and astronomer Adam Burgasser of the University of California, San Diego, and Eric Mamajek of NASA’s JPL provided an estimate between 5.4 and 9.8 billion years. The confirmation of seven rocky planets orbiting the star TRAPPIST-1, announced by NASA in February 2017, raised enthusiasm because it’s a very compact system in which all planets have such a position that at least in some regions on their surface there might be liquid water. However, there were still a lot of questions about that system and one of them concerned its age, an important piece of information to understand what level of evolution might have reached. The problem is that the star TRAPPIST-1 is very small and consumes its hydrogen very slowly so substantial changes that might be measured in spectroscopic analyzes require many billions of years. The scientists who studied that system believe that it’s at least half a billion years old because that’s the time a star of that mass takes to contract until it reaches its present size. Unfortunately, this information was too vague but now a new research provided an estimate of the age of TRAPPIST-1, though still rough. Adam Burgasser and Eric Mamajek collected various data that could give an idea of ​​the age of the TRAPPIST-1 system. The stars move in their orbit around the center of the galaxy at a speed that can provide an indication because the faster stars tend to be older. Other information came from the chemical composition of the atmosphere of TRAPPIST-1 and the amount of flares coming the star during the observation period. The flare problem was studied not only with TRAPPIST-1 but also with red dwarfs because these stars are small but are very active when they’re young, investing the planets that orbit them with high-energy radiation. The planets with a magnetic field have a shield that provides some protection, for the others the possible atmosphere would be really vulnerable and would be taken away by those flares. 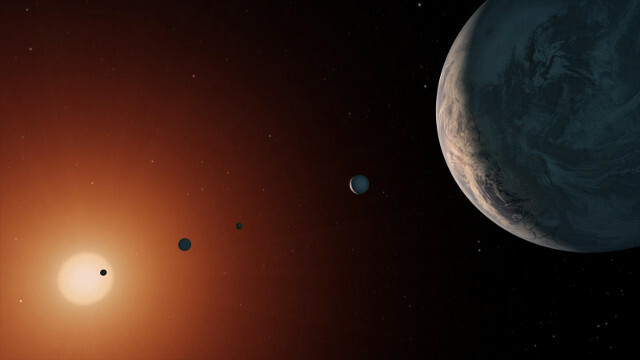 If the TRAPPIST-1 system is at least 5.4 billion years old, it means not only that it’s older than the solar system but is supposed to have passed its star’s most active phase. The information gathered on its planets indicate that they have a density lower than the Earth’s so they may contain larger amounts of volatile compounds such as water, which in the atmosphere can also provide some protection against their star’s flares. It’s difficult to determine the actual situation on the planets of the TRAPPIST-1 system because the information on them are still limited. Conditions may be very different because of different combinations of factors that, apart from the distance from their star, include the presence of an atmosphere and in that case its composition, the presence of liquid water in seas and more. In essence, the TRAPPIST-1 system could host the equivalent of Earth but also those of Venus and Mars. The first planets of that system were discovered less than two years ago so their study is still at the beginning. There’s great enthusiasm because this is an excellent example to study a solar system so many researchers are interested in observing it with the Hubble and Spitzer space telescopes. In the future, new instruments will provide even more detailed information so we can expect many more news about it.